Once you get it broken in, Red Wing 1907, a USA made boots molds to feet with such ease that it becomes a part of your foot, and you won’t even notice that you’re wearing boots! The exceptionally durable oil-tanned leather, triple stitching, traction tred rubber and flatter sole gives a more professional look if you wear them to the office or, are an engineer on job sites. The price is little high, but it is well worth the price. Quality construction, durable and so well built. The leather just looks better with age so keep on wearing them, and take care. These boots don’t have any insoles. Luckily only 1907 boot last is done to make room for an insole, for others, you will need to size up to make room for one. 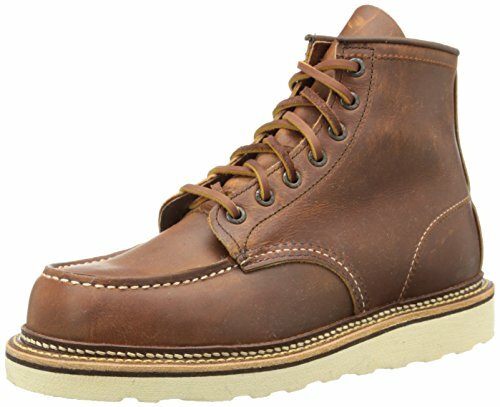 The Red Wing Heritage 1907 Moc 6” Boot have expertly crafted comfort boots that are also reasonably water-resistant. They are designed for long distance walking and keeping your feet warm and dry. They are made primarily of leather and have a rubber sole to help in slippery conditions. They are soft toed and do not have metal plating and so I would not recommend using them when working with dangerous machinery or chemicals. They provide excellent ankle support for traveling over uneven terrains as they have secure lacing up which helps keep your feet and ankle in place. Keep in mind that this ankle protection is not sufficient to ride on the motorcycle. If you need motorcycle boots go for the specialized motorcycle boots.They also have the classic moccasin toe that people associate with the Red Wing Heritage brand. Are you feeling bore to read all these review stuff? If yes, following video is for you. Sit back and watch the red wing 1907 review. Midsole penetration protection: Tough leather but no metal protection. Ankle Protection – Supportive lace design that ensures foot and ankle are tightly strapped in and supported. Chemical Permeability – Can block minor chemicals but is not approved by ASTM so they are not recommended for use. These shoes are priced between $239.49 – $338.94 and so these are on a more expensive range of the scale. I think this is because you are buying into an iconic brand which can be clearly distinguished by the moccasin toe. The quality of the leather is good and reasonably water resistant. These shoes are good for hiking and walking long distances as they are designed for comfort. They do not come with many practical protection features and so would not be suitable in most dangerous work places. They also have a supportive lace-up system that means your foot remains securely in place and does not rub with the shoe, causing blisters. Over time, the leather insole melds into your foot shape providing the optimum comfortability for each individual user. If you need conditioning boots that are exposed to rain, snow or mud, you can apply any shoe care products. For waterproofing, you can use Obenauf’s Heavy Duty LP 4oz though it tends to darken the leather to which its applied. Red wing 1907 is basically the 875 but in a higher quality leather/rawhide laces. The Red wing 1907s are more rugged-looking than 875.